I just came across this adorable breakfast nook from an old issue of Oprah magazine. 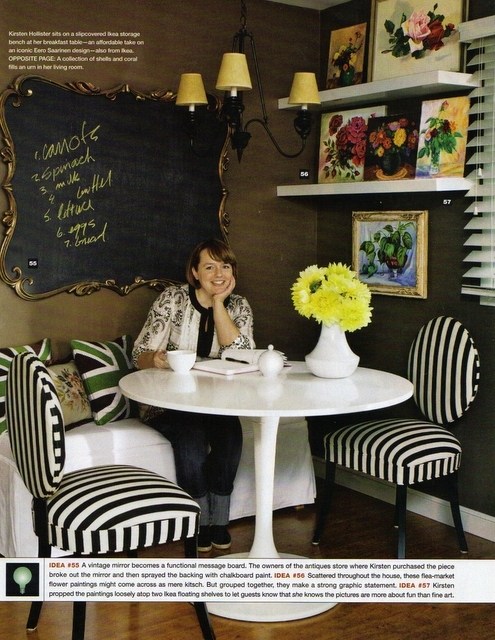 I’m in love with the striped chairs, the over-sized chalkboard, and the mini-gallery of oil paintings. I actually have a similar table already and black and white kitchen chairs; all I’m missing is some vintage art to recreate this look. I’m going to keep this image in mind for summer flea market inspiration! Wedding color inspiration. Twelve Chairs. 4 Responses to "Breakfast nook." I remember when this was published- I fell in love wtih the shape of that chalkboard- its so cool looking! I remember that photo! Love it!